Spearmint is ideal for relieving headaches, stress and fatigue. Spearmint contains menthol which stimulates mental activity and enhances mood, soothes muscles and relieves aches. 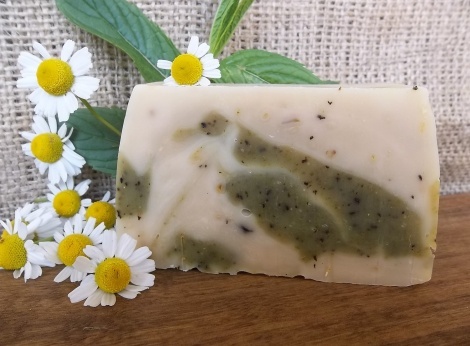 Chamomile is often found in lotions and ointments and is believed to have a healing and rejuvenating effect on the skin. This handmade spearmint & chamomile soap will simply leave you feeling cool, refreshed and energized.